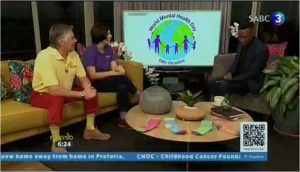 Crazy for Walking project CEO spoke to Channel Africa on 10 October 2018. Crazy for Walking project CEO spoke to Su-An from GROOT 90.5 fm on 10 October 2018. Crazy for Walking project CEO spoke to Cyril from OFM on 10 October 2018. Listen to Radio Rosestand 100.6 FM on 8 & 9 October 2018 as Suzanne Wille (Bloemcare) will be interviewed about the stigma of mental illness and the Crazy for Walking initiative. 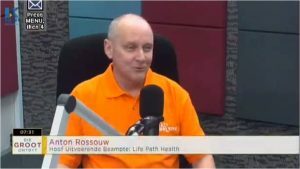 Listen to ALGOA FM on 9 October 2018 @ 08:20 as Francois Louw (project CEO) will talk about the stigma of mental illness and the Crazy for Walking initiative. Listen to Radio Cape Pulpit 729 AM on 8 October 2018 at 10:45. Marlene vd Berg (Crescent Clinic) about the stigma of mental illness and the Crazy for Walking initiative. Dr Karen Olckers (Life Path Health) at Radio Helderberg 93.6 fm studio on 8 October 2018. Vista Clinic has been a sponsor of the program “Tot die punt” on KruisKyk TV for many years. Watch a video clip of an interview giving focus on the Crazy for Walking initiative in the sponsored Vista Clinic time slot. Marlene vd Berg (Crescent Clinic) and presenter Benito Vergotine at Smile 90.4 fm. David O’ Sullivan wearing #CrazySocks in support of the Crazy for Walking initiative. Watch Morning Live on SABC 2 Monday 1 October 2018 at 08:30 as Francois Louw (Project CEO) will talk to presenter Leanne Manas about the stigma of mental illness and the Crazy for Walking initiative. 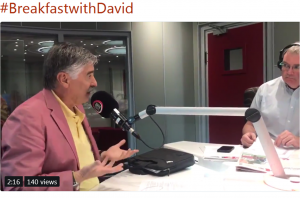 Anton Rossouw and Dr Karen Olckers (Life Path health) at the Good Hope fm studios in Cape Town on 26 September 2018. Click here to listen to a recording of the interview. Sara-Jayne King between, Francois Louw (Vista Clinic) & Marlene vd Berg (Crescent Clinic) at the Cape Talk studio in Cape Town on 25 September 2018. Listen to presenter Bertha le Roux on Radio Kansel/Pulpit 657 AM on 20 September 2018 from 09:00 – 11:00 as Francois Louw (Project CEO) and Dr Jerrie Bezuidenhout (Psychiatrist) will talk to her about the stigma of mental illness and the Crazy for Walking initiative. 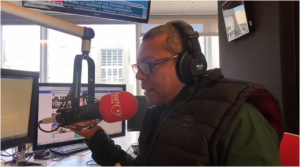 Mr Francois Louw (Project CEO) spoke to presenter Aubrey Masango on 702 talk radio on 18 September about the stigma of mental illness and the Crazy for Walking initiative. 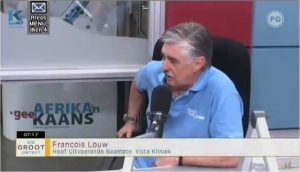 Francois Louw (Project CEO) spoke to presenter Tony Blewitt about the stigma of mental illness and the Crazy for Walking initiative.